It was our AGM this week and we had a good turnout. Thanks in particular to our president Lord Baden Powell and our patrons The High Sheriff and The Bishop of Dorking for making time in their busy schedules to attend. As well as the business part of the meeting, we had great talks from two young people who have both had very challenging life histories and have come through shining, a inspiration to us all. We were very grateful to them talking at our AGM. Here is a bit about their histories. Shannon had a difficult start from a young age – her mother had a mental breakdown and was absent from home for months on end. Her father could not cope with parenting Shannon and her younger brother. Shannon was expelled from school and joined a gang at the age of 14, getting into lots of trouble with police and authorities. Later, she got a new boyfriend who was not in the gang and initially seemed nice, but later became violent after she got pregnant. Then 3 months after giving birth, Shannon’s brother died in a car crash. Shannon developed extreme depression; however, after calling the police 13 times, she eventually found the strength to send her partner to prison. Shannon found out about the charity called Straight Talking and applied for a job as a peer educator. She was really nervous to start with, but they encouraged her to develop confidence and she has since developed many skills not only for work but for life as well. She has been promoted twice. Her life has improved massively and she is a much better and stronger person - she knows her worth and believes that she can achieve almost anything she wants to in life. Our other speaker, Dan Eley, had a very different set of personal challenges. He worked as a charity worker with impoverished children in Latin America for two years before a diving accident in the Colombian Amazon left him paralysed from the chest down two years ago. Dan spent a year in hospital, fighting for his life and facing up to the enormous emotional and physical challenges of being severely paralysed. During these difficult times he had the opportunity to meet other people with similar disabilities who had overcome extreme adversity to go on and achieve great things in life. This inspired him to pursue his dream of starting the Dan Eley Foundation to deliver apprenticeship-style training schemes for children living in poverty in Colombia and Latin America. Since its inception in 2012 the Foundation has funded and implemented three six-month apprenticeship training courses in conjunction with a partner charity in Colombia and is currently in the process of funding its fourth. Despite being in a wheelchair, Dan travels to Colombia twice a year to interview candidates for the course, visit graduates in the work place and help run clinics in the slums. The foundation also runs schemes for young people in Surrey. Both Shannon and Dan have dug deep and found incredible inner strength to overcome their challenges. They have shown amazing bravery in the face of adversity. And again they have shown bravery in sharing their challenges with the world, talking openly about their difficulties as well as their triumphs. They are an example to us all not to put up with the status quo. My challenge to you this week is a little different. Imagine that you have the same levels of bravery as Shannon and Dan. Imagine that you have the confidence to speak out about something that you normally keep quiet about or make a major change in your life to become happier. What would it be? The issue of affordable housing and the greenbelt came up several times this week. Too many people, houses too expensive, no space left to develop. As a society we are building up to a crunch point. For those on the minimum wage, how can they afford to live in Surrey? How can young shop workers, cleaners and postmen get a decent place to live. Even for new graduates, with a an average starting salary of £22-25k, it’s a number of years before many of them can get close to a mortgage, and even then for the smallest of properties. How much longer is it going to be before the richest 1%, mostly bankers and people with inherited wealth, are the only people who can afford more than a one-bedroom flat in Surrey? How are we going to survive when newly qualified nurses, teachers and even doctors can’t afford to live within reasonable commuting distance of Surrey towns? In my neck of the wood, Waverley is consulting on its’ draft local plan. No one wants green belt to be built on, few people are delighted at the prospect of development in their own vicinity and we all want to continue to receive the public and private sector services that we always have. We want to buy our home ourselves, or for those of us lucky enough to be on the property ladder, we want our children and grandchildren to be able to buy a comfortable home in Surrey. The good news is that innovation is more often spawned from difficult situations than when everything is going smoothly. As I learnt when helping my son to research the Victorian era for his history homework, the great Victorian Era sewers which are still in use today were developed in response to the Great Stink of 1858. Solving the housing problem may require innovation in social systems, in housing design, in economic policy. We need as a society to think bigger, to think laterally, to make sure we are addressing the right problem. For example, asking the question “how can we do more with existing sites?” opens up a wider range of thinking than “where can we find land to build new houses?” Recently I heard someone suggest that a piece of land with a public toilet in Farncombe could be redeveloped to include some flats as well as public conveniences. As a society, we need to shift our thinking. My challenge to you this week is a big one: how can you make a contribution to help young people be able to live in comfortable housing at affordable cost in Surrey? Can you think of some different questions to ask? Can you think of some new ideas? Are you ready to embrace Victorian ambition? I have always loved doing sport and now enjoy supporting my kids to do likewise. As a family we love cycling and walking together and despite having qualified for Vets teams for a long time I still get my hockey stick out once a week for a casual game of five-aside with a group of friends. So as the theme of sports and activities came up several times this week it seemed an appropriate subject for my second blog. Sport can have so many benefits in a young person’s life – building friendships, keeping them fit and healthy, encouraging them away from anti-social behaviour and building resilience, self worth and self-belief. In case you missed it, an excellent report from Sport England on The Challenge of Growing Youth Participation in Sport was highlighted in a newsletter by our colleagues in Active Surrey. A must read if you would like to help increase young peoples’ participation rates in sports. One of the findings is that the supply of sport tends to reach those already engaged. An organisation trying to address this is StreetGames, who I met with this week. They support a network of projects across the UK including Surrey designed to help build capacity for sports close to home in deprived areas, through a programme called Doorstep, and they are looking to do more in Surrey. If you are involved in sports events in deprived areas, then StreetGames may be able to help you with a package of training, free resources, fundraising advice and more. In Surrey it is easy to think that everybody can afford to do sports but this is not always the case. We had a phone call from a lady looking for monetary assistance for a talented teenager who has been selected to train with an elite sports team 50 miles from her home, but her parents were struggling to pay the travel expenses. This is doubly hard when the vast majority of your peers in school or sports clubs don’t experience the same financial issues. Another group who often find it harder to access sporting activities are disabled children and young people. Luckily for many across Surrey and Hampshire they have access to the wonderful schemes and play centre run by Challengers. I first heard of this organisation a few years ago from a friend who raved about their services. So it was with a personal and professional interest that I visited their purpose built facility in Stoke Park, Guildford. I wasn't disappointed - beautifully designed to provide a fun, safe environment for kids to be active in - with happy children playing inside and out - I can see how the staff and environment combine to significantly enhance the lives of children and young people with disabilities and their families. I dream of a Surrey where all young people are active and involved in sport regularly. I have a challenge to you. Can you personally do more to help encourage young people to be active or participate in sports? Whether it is running a project in your professional life, encouraging a child to walk to school or volunteering at your local football team, it all helps towards a more active generation of youth in Surrey. It is an honour and a privilege to have taken over from Mike Abbott as CEO of Surrey Youth Focus this week. It is of course, my job to extoll all of SYFs good points. It is particularly easy for me to do it now, when all of the credit goes to others. 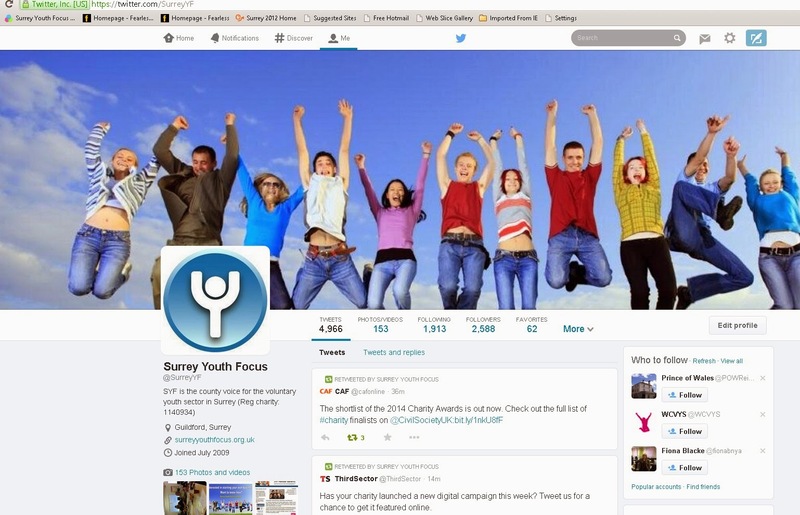 There are so many good things about Surrey Youth Focus that is hard to know where to start. The staff team are extremely talented and hard working. It is hard to believe that all of the work that you see (and don’t see) is done by a team of 3.75 Full-Time Equivalents. The number of high quality relationships that the organisation has is huge – across all sectors of Surrey statutory, voluntary and private organisations, with the support of a president, vice president and patrons of the highest order. We have an excellent, talented board with a wide range of skills for good governance. We have an exciting range of services on offer that enable our members to keep informed, meet new people, learn new skills and celebrate the achievements of young people. Furthermore, new exciting services are in development including our first Youth Social Action conference and Communilab, our network to enable cross-sector collaboration to address youth issues in Surrey. Part of our role that may sometimes be less visible is to help address issues affecting young people, such as mental health, by representing the youth voluntary sector on various committees around the county. The website is extremely well laid out and is updated regularly and we have a good social media presence. And behind the scenes we have all the policies and procedures in place that are needed for a high quality organisation, as has been endorsed by the Charities Evaluation Service which has recently recommended us for Pqasso level 1. All of this is a huge testament to the work of Mike Abbott who retired last week. I owe a big debt of gratitude to Mike, not only for leading the organisation to where it is today, but also for working tirelessly over the last few months to “draw a line” under as many initiatives as possible (such as our Pqasso assessment), so that I was not left to pick up pieces. Although I officially started on 21st August, Mike and I have been working over the last few months to affect a smooth handover. Despite this, the last week with Mike felt like coming up to exam time… cramming to get all of the knowledge that I could into my head. Mike promised me no skeletons in the cupboard and I have found none, not even a few bones. Mike is a hard act to follow, I hope that I can build on all the excellent work to continue scaling new heights. To this end, I am seeking to understand “from the horse’s mouth” the value that organisations get from working with us. I would be grateful to get feedback on Mike’s blog, to ensure that I continue to include the bits that you find useful whilst creating it in my own style. What value do you get from it? Why is that important? What difference has it made? The purpose of all this is, of course, to serve the young people of Surrey. To this subject I will turn next week.